Facebook is still huge. For pages, it might no longer be the same as it was, with fewer of our followers now seeing the posts, but it is still an important resource for bloggers and you should continue to maintain and market your page and use it to bring visitors to your site and subscribers to your newsletter. 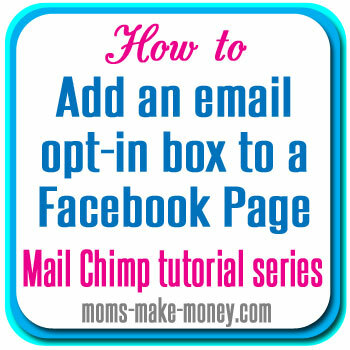 So in this video in the Mail Chimp Tutorial Series, I’ll be showing you how easy it is to add a newsletter sign up tab to your menu and a sign up form to your Facebook page. If you don’t yet have a subscribers list set up, do go back and visit part one of this series and I’ll show you step by step how to get started. Note – you can make these videos larger using the full screen option bottom right, so you can follow through the on screen instructions more clearly. You can also increase the video resolution to give greater clarity and definition using the little gear icon that appears on the bottom menu once it starts playing. As soon as I get my newsletter up and going, I’ll be doing this step two. Thanks! This is so awesome! Thanks so much for posting this. 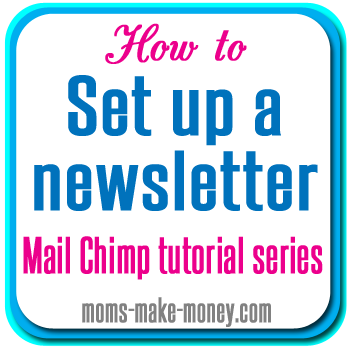 I already had a mail chimp account and newsletter list, so this was super easy for me to set up! I have a ‘Blogging Tips’ board on Pinterest, and I’m pretty sure 90% of my pins are yours. Thanks for the amazing tips! Have a great weekend! Thank you so much for pinning and promoting my posts. I try to make all of my info simple yet comprehensive at the same time. Some you can do in 10 minutes and some bigger projects too. The Mailing List series is certainly one you can build up over time. You’re gonna love the post on the custom opt-in boxes! Another great post! I will definitely try this. I set up my mailchimp newletter account last week end using your great videos. Thanks so much for sharing your knowledge! awesome tutorial for setting up Mail Chimp. Thank you so much. Thanks for the great Facebook tips! I have been following your site for the last several months and I always find your information so useful. Thanks for posting! I just finished reading (and following) this Mail Chimp Series and sent out my first Beautiful Newsletter! Thank you so much for all the great videos and directions! You are AMAZING! Yay – congratulations Sharon. Well done on your first newsletter. I’m so glad you found it useful.